Ryan Jackson, part of the Tech team at the White Plains Public Library in New York State, was looking around for a cheap way to boot one of his dead hard drives when he came across APC and thought it would be a great fit for the library. He contacted us about receiving a unit to test and see if it would be suitable for their needs. “For our purposes here at the Library, I saw it as possibly being well suited for use as an OPAC (Online Public Access Catalog), those systems only needing to provide browser access to the Library’s online resources, primarily the catalog. Another possible use would be as a low cost express email kiosk system for public access,” said John Lolis, Manager of Information Technology, White Plains Public Library. 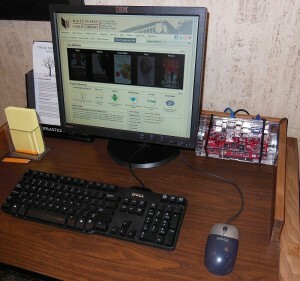 After receiving an APC, they decided to install Mike Thompson’s bootable Raspbian Arpicot image of Linux and installed the Chromium web browser, the Google Chrome Browser for Linux, in order to provide a more robust set of features than the Midori web browser that was packaged in the Raspbian Apricot image. After locking the system down with some customized scripts, they have now deployed their APC to serve as an OPAC system “I’m confident at this point that the APC would satisfy our needs for a very low cost, low power and small footprint OPAC system,” said John Lolis. “The system board is now mounted in Mike Thompson’s clear acrylic snap-together case and it’s now prominently deployed as “Our New, Low Cost Experimental Online Catalog PC.” They are currently testing it in the library, so if you happen to stop by there be sure to check it out by the Reference Desk as you enter the lobby. To read more about their experience, click here. To read more about their work installing Raspbian, Chromium and how they locked down their system, click here.